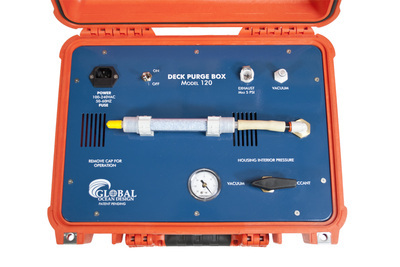 The Deck Purge Box (G-107) in combination with a self-sealing purge port and pressure proof cap is an innovative solution to remove moisture from deep sea housings, both spheres and cylinders. The integrated system of the Deck Purge Box (DPB) creates a vacuum inside the deep sea housing. 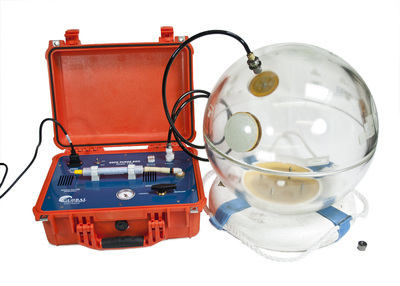 That same vacuum is used to draw air back into the sphere, forced to pass through a drying desiccant cartridge. After a few cycles, the interior air is dry below any dew point possible in the cold ocean depths, making certain all electronics or cameras will not have condensation on them. After the purging process, the operator removes the purge fitting from the self-sealing purge port, and a center check valve automatically seals. The center check valve prevents the interior vacuum from drawing any air-laden debris across the greased o-ring seal surface, eliminating a potential source of seal failure, while the dry interior air created by the DPB is isolated from the ambient moist air of the ship. The operator has time to carefully clean, inspect and install the pressure cap on the self-sealing purge port. The guys in the field will love this. The principle behind the DPB is simple. An instrument housing closed on-board a ship traps moist sea air inside. When that housing descends into a colder sea, the temperature inside can drop below the “dew point”, where the air no longer holds all of the original water vapor. Fog fills the sphere, and water condenses on everything. Loose desiccant packs are passive, and cannot react fast enough. The DPB dynamically removes moisture from the air before launch. 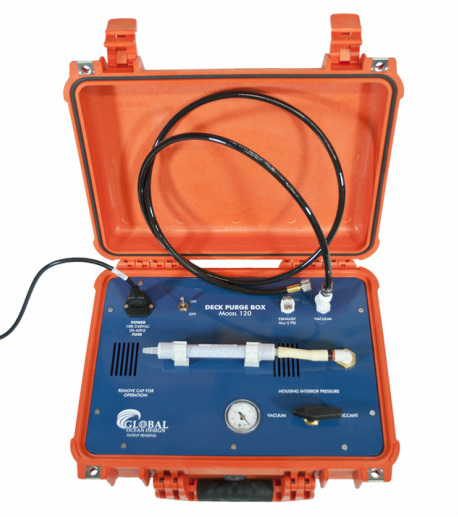 The instrument is ready for deployment as soon as the purge cycle is done. 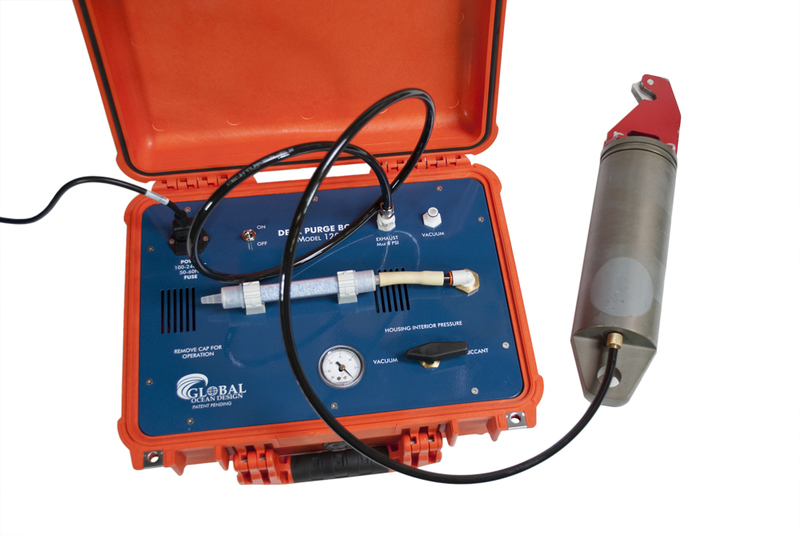 For more information see our article "Moisture Control in Subsea Housings" (Ocean News & Technology September 2014). A retrofit self-sealing purge port is available for VITROVEX® or Benthos® spheres of any size or wall thickness, making the DPB backwards compatible with most instrument spheres in current service. No HazMat, such as high-pressure cylinders.